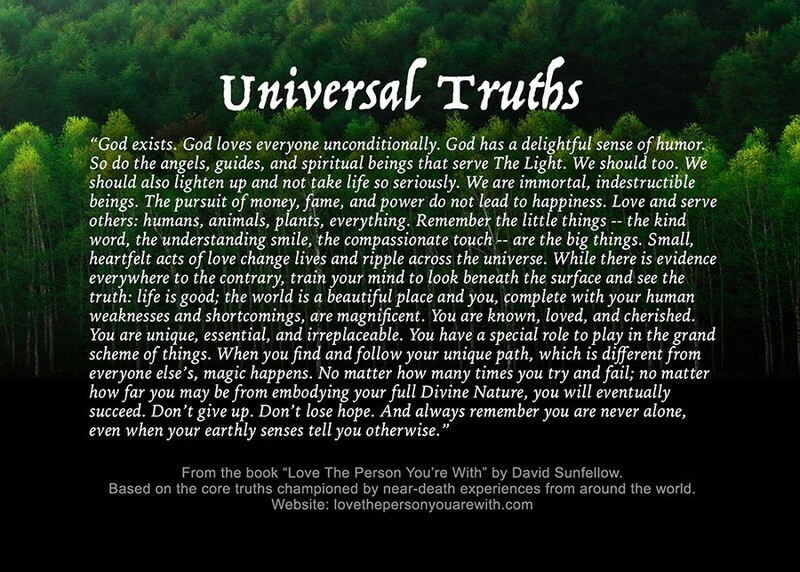 Version 2.0 of “Universal Truths” consists of 88 statements that are based on the core truths found in near-death experiences from around the world. This updated list appears in my book, Love The Person You’re With. 2. God is an all-knowing, all-powerful Being who knows and loves everyone. 3. Words cannot describe how profoundly God loves us, or how deeply God is involved in every aspect of our lives. 4. God loves everyone unconditionally; there is nothing we can say, do, or think that can stop God from loving us. 5. While God, the Creator of all life, appears in many forms, He/She/It is most often experienced as a loving, indescribably wonderful Light. 6. God is also experienced as a vast energy field of love and light. Composed of everything in existence, this Divine energy field is alive, sentient, and communicative. So are all the parts that make It up. 7. If we go deep enough, we discover that we are God, The Source of all life. We are also life in all its manifestations. 8. Angelic beings and heavenly realms exist. 9. So, too, do evil beings and hellish realms. 10. Both are essential and beloved parts of life. 11. In this world and the next, the realities we experience are created by our thoughts, feelings, and actions. 12. We create our experiences alone and in cooperation with other beings who vibrate at frequencies similar to our own. 13. The more godlike our vibrations, the more godlike the realms and states of consciousness we experience — and vice versa. 14. Our intentions are more important than what we say and do. 15. God has a delightful sense of humor. 16. So do the angels, guides, and spiritual beings that serve The Light. 18. We should also lighten up and not take life so seriously. 19. We are immortal, indestructible beings. 20. We should act accordingly. 23. Follow your heart even if all the world opposes you. 24. The world is a dream. 25. All illnesses, disabilities, and limitations are illusions. Honor their presence and receive their gifts, but don’t allow them to define you. You are an eternal being made in the image and likeness of God. When you awaken, all illnesses, disabilities, and limitations will vanish. 26. While the world is a dream, it serves a glorious purpose. 27. If we try to leave this world before we achieve the purposes for which we were born, we get sent back. 28. We are here to love, learn, and have fun. 29. The pursuit of money, fame, and power do not lead to happiness. Ditto for other activities that inflame egos and promote selfish, materialistic goals. 30. Seek to get in your body, not out of it. 31. Honor your body and take care of it. It truly is the temple of God. 32. Honor your intellect and emotions. They are also gifts from God. 33. Seek to fully experience — and master — your earthly life. 34. Don’t waste your time in this world longing to be somewhere else, including back home in Heaven. You are here because this is where your soul wants to be. 35. Instead of longing to leave this world, bring Heaven here; make the world around you a reflection of higher, more loving, caring, and compassionate states of consciousness. 36. Tackle life’s challenges head on. 37. Avoid cheating, short cuts and quick fixes. 38. Remember that you, and everything else, is perfect just the way it is. 39. Also remember that everything is not perfect and it is your job to make the world (and yourself) better. 40. When we are one with God, we know everything. 41. When we are human beings, we forget everything, including who we are and why we came here. 42. We remember who we are and why we came here by seeking God and applying what we learn — little-by-little, step-by-step — to everyday life. 43. Ask God and God’s angels, guides, and messengers for their help. 44. The spiritual forces of life have dominion over this world. 45. When we touch, or are touched by, The Divine, miracles of all kinds are possible. 46. Tell the truth — to ourselves and others. Telling the truth connects us with God; dishonesty separates us and creates pain, suffering, and confusion. 50. Work on shadow issues. 51. Pay attention to dreams. They are connected to everything and reveal, in surprising and magical ways, what we need to know and do. 52. Join with others. They see what we cannot see. They are also the main way that God loves us and takes care of us in this world. 55. Be willing to be hurt. 56. When you fall down get back up and try again. 57. Be kind and gentle with yourself. 58. Honor your human weaknesses — and the human weaknesses of others. 59. Treat others as you want to be treated — with patience, compassion, and understanding. 60. Be curious and discerning, not judgmental or condemning. 61. Remember when we throw stones, we are throwing stones at ourselves — literally. 63. Don’t be satisfied with pat, status quo, superficial answers. 64. Pray (talk to God). 65. Meditate (listen to God). 66. Love and serve others: humans, animals, plants, everything. 67. Remember the little things — the kind word, the understanding smile, the compassionate touch — are the big things. 68. Small, heartfelt acts of love change lives and ripple across the universe. 69. Give others your full attention. 74. Everything — every person we encounter, every event we experience, every challenge we face — has been specifically designed to lift us from lower levels of consciousness to higher ones. 75. Feel and express gratitude for everything, including the challenges in life, which are blessings in disguise. 76. Learn to think intuitively, in non-linear, non-time-based, non-rational ways. 77. Spend quality time in nature. 78. Spend time with others who have experienced The Light. 79. Embrace threshold experiences (birth, death, illness, and other portal-opening events). 80. 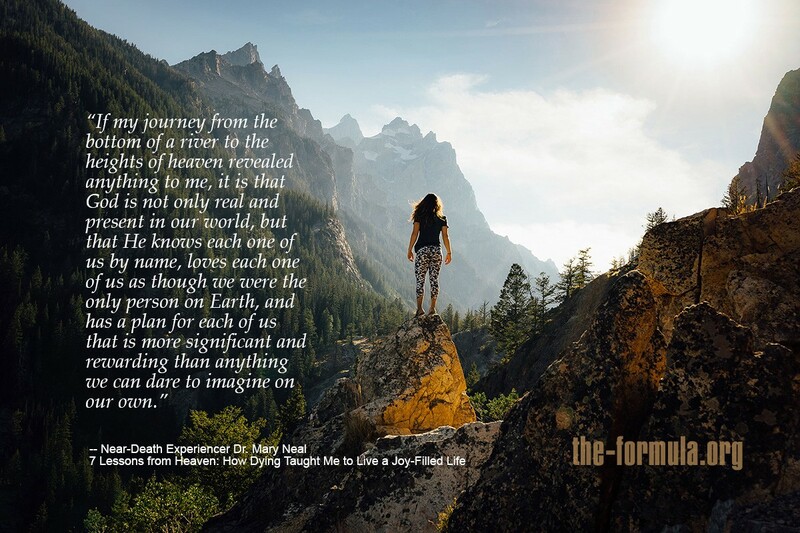 Study near-death experiences (and related phenomena). 81. While there is evidence everywhere to the contrary, train your mind to look beneath the surface and see the truth: life is good; the world is a beautiful place and you, complete with your human weaknesses and shortcomings, are magnificent. 82. You are known, loved, and cherished. 83. You are unique, essential, and irreplaceable. 84. You have a special role to play in the grand scheme of things. 85. When you find and follow your unique path, which is different from everyone else’s, magic happens. You connect with God, you feel happy and fulfilled, all creation rejoices. 86. No matter how many times you try and fail; no matter how far you may be from embodying your full Divine Nature, you will eventually succeed. 87. Don’t give up. Don’t lose hope. 88. And always remember you are never alone, even when your earthly senses tell you otherwise.